Do You Want To Get Pregnant? Detect Ovulation Accurately! Knowing how the female ovulation cycle works is very important when it comes to understanding more about your fertility and achieving conception. Many women who are trying to conceive are unsure about their ovulation sings and fail to get pregnant as a result. The female ovulation cycle varies from woman to woman and each woman does experience variations throughout her cycle. 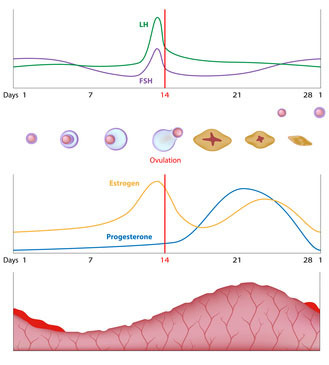 How Does The Female Ovulation Cycle Works? During ovulation, a mature egg is released from one ovary. It is difficult to calculate ovulation because it occurs 12-16 days before your next period arrives. Thus, you cannot really know when you ovulated until you have your period. This makes trying to conceive based on ovulation alone difficult to predict. You do not ovulate at the same time every month, but you definitely have a unique ovulation pattern. The average menstrual cycle is 28 days in length with most women having a cycle lasting anywhere between 25 to 35 days. Day 1 is the first day of bleeding. If you have spotting before your true period, do not count spotting as part of your new cycle. Ovulation is said to occur on day 14, but this is not true in all cases. Most women ovulate anywhere between day 8 to day 22 depending not only on the length of their cycle. The length if the luteal phase depends on the balance between estrogen and progesterone within the body. This delicate balance is what triggers ovulation to occur each month. What Happens During The Female Ovulation Cycle? Your ovaries contain thousands of follicles containing immature eggs. Each month one follicle reaches maturity releasing the egg. The female ovulation cycle is a very complicated process regulated by female reproductive hormones and controlled by the hypothalamus and the pituitary gland. This small gland located at the base of the brain releases two important hormones: the Follicle Stimulating Hormone (FSH) and the Luteinizing Hormone (LH). Watch this video as it describes the female reproductive cycle in detail. The first half of the female ovulation cycle is regulated by the FSH, which stimulates the maturation of the follicles in the ovaries. More than one follicle may be maturing at one time, but only one reaches maturation and is released at ovulation. The cells that make the follicle are under the stimulation of the FSH to produce estrogen. Estrogen has a very important role in preparing the endometrium (lining of the uterus) to grow and prepare for implantation. Under the influence of the FSH, about 15-20 eggs start to develop and mature in each ovary. This happens every month. During the first half of the menstrual cycle (follicular phase), the estrogen levels slowly increase until they reach a certain level that signals the pituitary gland that the ovary is ready to release a mature egg. The time that it takes to ovulate each month depends on how long your body takes to reach this estrogen threshold. So generally, you can ovulate anytime between day 8 to day 22 in your cycle. Each female ovulation cycle will differ depending on her hormonal levels. High levels of estrogen trigger the LH surge. This is what your ovulation kit is measuring. This surge causes the release of the egg from the mature follicle. The egg is collected by the fimbria at the end of the fallopian tubes and gently guided through its journey toward the uterus. The egg will be fertilized in the fallopian tube and the developing embryo will tumble down toward the uterus where implantation will occur. After the egg has been released by the ovary, the follicle becomes the "corpus luteum." It remains in the ovary and begins producing the hormone progesterone, which dominates the entire luteal phase. During this phase, in fact, estrogen levels are low while progesterone levels are high. The corpus luteum has a life of 12 to 16 days. It is important for the corpus luteum to be viable for at least 10 days in order to continue producing progesterone and prevent the shedding of the uterine lining allowing the implantation of the embryo. Progesterone, also prevents the pituitary gland from releasing FSH and LH to avoid ovulation during pregnancy. If the egg is not fertilized, implantation does not occur and the corpus luteum ceases to produce hormones. The drop of progesterone and estrogen levels triggers the menstrual period and a new cycle will begin. When the egg is released from the follicle in the ovary, it has to be collected by the fallopian tube. At times this does not happen and the egg is missed. If fertilization does not occur, the egg remains alive for 12-24 hours. After that it literally disintegrates and it is reabsorbed by the body or released during menstruation. In order for fertilization to occur there should be lots of healthy sperm present. The sperm survives longer than the egg in the female reproductive tract (3-5 days) provided that there is lots of healthy fertile mucus. This fertile mucus looks like egg white and it is slippery and very stretchy. This information is very important when trying to conceive because having lots fertile mucus is important during ovulation and making love just before ovulation is vital so that the egg can be fertilized as soon as it is released from the ovary since it has such a short life span. 1. Slight pain in the lower abdomen. 3. Increase in body temperature. The female ovulation cycle has only one aim: pregnancy! If the egg released by the ovary is fertilized, a new life will develop in the next nine months. The fertilize eggs implants itself into the lining of the uterus and begins to produce a pregnancy hormone, the Human Chorionic Gonadotropin (HCG). The release of this hormone is vital for the survival of the new developing embryo. In fact, HCG signals the corpus luteum in the ovary to continue producing progesterone and remain vital by supporting the uterine lining and prevent the menstrual period. Some women may experience a very light blood discharge at this time and still have a viable pregnancy. Most women are able to get pregnant simply by learning when it is the most fertile time of the month for them. Others are having difficulty due to hormonal imbalance and irregular menses, which make it difficult detect ovulation. If this is your situation or if you simply want to know the best time of the month for you to achieve pregnancy, I would recommend using a fertility monitor like Ovacue. If you trying to conceive and need additional information on overcoming infertility, you will find useful tips and fertility secrets on The Pregnancy Blessing eBook. This easy to read eBook will provide excellent information on how to overcome infertility and plan for a healthy pregnancy and baby.